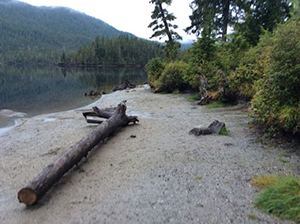 A small, forested lakefront campground only a short distance east of Prince Rupert. Nearby Diana Lake Provincial Park provides opportunities for a variety of day-use activities. 16 km East of Prince Rupert on Hwy 16. Conservation: There is an interesting nature trail, located nearby at Diana Lake Provincial Park, that winds through the lush coastal rainforest. Wildlife: Black-tailed deer can be found in the Diana Creek Falls area. (1 km southwest of Prudhomme Lake.) Five species of Pacific salmon, as well as Dolly Varden can be found in the lakes and creeks here. In August and September, salmon spawning occurs in Diana Creek. There are paddling, canoeing and kayaking opportunities at this park. Five species of Pacific salmon, as well as Dolly Varden can be found in the lakes and creeks here. In August and September, salmon spawning occurs in Diana Creek. Anyone fishing or angling in British Columbia must have an appropriate licence. Please refer to current fishing regulations. There is no designated swimming area but you can swim in the area. There are no lifeguards at provincial parks. A hand pump is located next to the information shelter at the park entrance. This park offers 24 vehicle accessible campsites on a first-come, first-served basis, and campsite reservations are accepted. Sites range from small to medium sizes. There are two double sites available. Most sites are shaded by the surrounding coniferous forest. The gate is left open to accommodate ferry traffic. There is one wheelchair accessible campsite available. BC Senior’s Rate (day after Labour Day to June 14 only): $10.00 per senior party/night. Read the User Fees Policy for information on Senior Camping Discounts. There is a campsite and a pit toilet that are wheelchair accessible.